Of any historical figure in Middleborough, more consideration has probably been given to Peter H. Peirce than any other save for Peter Oliver and Deborah Sampson. One aspect of Peirce’s history which is largely overlooked, however, is the sad story of his younger son, Levi L. Peirce (1825-54) who suffered from mental illness. Because little is known of Levi Peirce’s circumstances, even George Decas’ authoritative and compelling biography of Peter Peirce - Col. Peter H. Peirce (1788-1861): A Plymouth County Life - barely touches upon the tragedy of his son. At the time of Levi L. Peirce’s birth, mental illness was much less well understood than at present. Those exhibiting signs of illness were most frequently considered to be in possession of the devil. Treatment consisted of confinement either at home or in public institutions such as almshouses and jails. Frequently, worse treatment was meted out. Not until the 1830s did Massachusetts state law prohibit the housing of the mentally ill with criminals in local jails, and it would take longer still for social convention to stop referring to the residents of mental health institutions as inmates rather than patents. Horace Mann, Dorothea Dix and Samuel Gridley Howe, all better known as advocates of other social causes, were champions during this period of a more humane approach to the caring and treatment of the mentally ill in Massachusetts, but their successes were frequently few and far between. Virtually nothing is known of Levi Peirce’s illness, what prompted it or when signs of it first became visible. Named for his paternal uncle who was a benefactor of Middleborough's Central Baptist Church and the Peirce Academy, Levi L. Peirce was a student at the same academy from which he graduated in 1843 following which, as noted by Decas, “there is no indication of his occupation….” Apparently he did not attend Brown University as had his older brothers, and it may have been that signs of a serious illness had already manifested themselves. Numerous visits paid to the Peirce home during the mid-1840s by the Peirce family physician, Dr. William R. Wells are on record and some of these calls may have been made to attend Levi. Certainly at some point Wells and another local doctor were called in to assess Levi Peirce, and make the fateful certification regarding his sanity. Not on record is Peter Peirce’s reaction to his son’s affliction, though undoubtedly it greatly aggrieved him. Also, unquestioned is the fact that Peirce presumably sought the best treatment for his son, though few options were then available. The closest specialized care was available only at the McLean Asylum in Somerville and the Worcester Insane Asylum in central Massachusetts. The Worcester Asylum, a state-operated institution, was notoriously overcrowded, in fact dangerously so, and had acquired a reputation for less than desirable conditions. Also, as a state institution it was enormously burdened and its consequent ability to provide the level of care sought by the Peirce family undoubtedly met with their skepticism. (The Taunton State Hospital for the Insane which was built to alleviate conditions at Worcester, did not open until 1853). Consequently, there was little choice and Peirce was brought to McLean Asylum in Somerville. It is not readily clear as to how long Peirce remained at McLean, but apparently long enough for Peter Peirce to become disillusioned with its treatment of his son. 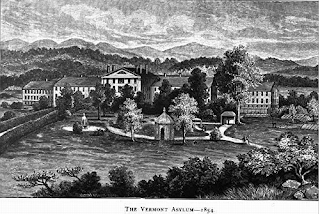 Ultimately, in 1853 or a few years earlier, Levi Peirce was moved from McLean and brought to the Brattleboro Retreat (originally known as the Vermont Asylum for the Insane) in that Vermont town. What specifically prompted the decision to relocate him to Brattleboro is not known. Certainly however, Colonel Peirce had become familiar with Brattleboro’s high reputation as an institution well regarded for the level of its treatment which differentiated it from other institutions, and with the family’s wealth, money would have proven no object in obtaining a place for their son there. By the time that Levi Peirce came to Brattleboro, the Retreat had fifteen years of practical operation behind it and had become one of the more popular institutions for treatment, serving both as the state facility for Vermont as well as accepting private patients, such as Peirce, on a fee paying basis. Certainly the Peirce family could well afford the cost associated with the treatment, and for its part, the institution would have welcomed Peirce as a fee-paying patient of some social standing. (Following 1857, the Retreat added a number of suites for patients of “superior social position” suffering from alcoholism, who would take their meals with the head of the institution). Peirce would have been brought from Somerville to Brattleboro by train which had only reached the Vermont town in 1849 when the Vermont and Massachusetts Railroad constructed its line through that place. Nonetheless, it still would have been a long and tiring journey. Upon arrival, Peirce would have been provided with a private room with bed, a fixed seat, chair, work table and mirror. The room would have been painted white and been provided with a window in contrast to the cell-like accommodations of other institutions. Depending upon the severity of his condition, he would have engaged in some form of occupational therapy perhaps in the garden or attending to duties on the adjacent dairy farm, and he would have been encouraged to attend the lectures, dances and theater sponsored by the Retreat, as well as to partake of daily walks in the open air, activities similar to those he would have enjoyed at Middleborough. By 1853, Peirce would have been one of about 360 patients at the Retreat. Ultimately, however, Brattleboro could not cure Levi Peirce, though one hopes it eased his final years. He succumbed to his travail at the age of 29 on August 7, 1854, at which time the cause of death was noted somewhat obscurely as “Mania Tranquil”. Nor is it known how greatly a smallpox epidemic at the Retreat in 1853 or a subsequent dysentery outbreak the following year may have affected him and contributed to his decline and ultimate demise. The impact of Peirce’s situation upon his family, particularly his brothers, may only be guessed, but their failure (with the exception of the oldest Charles and the youngest James) to marry, might be attributable to the circumstances of their unfortunate brother. Mid-19th century thinking greatly feared the hereditary nature of mental illness and Levi’s illness may only have served as a deterrent to matrimony for Peirce family members, some of whom were even at that time characterized as peculiar. Though whether the Peirces saw shades of their brother’s illness in themselves, will never be known. It was here in the Peirce House that Levi L. Peirce spent the first two-thirds of his life and where, undoubtedly, his illness first manifested itself and was initially diagnosed. The engraving depicts the McLean Asylum in the mid-1840s, about the time that Levi L. Peirce was admitted as a patient there. The institution relocated to Belmont in 1895 where it operates as McLean Hospital. The "Brattleboro Retreat" was situated in a serene natural setting. The main building, known as the "White House", was designed in a refined Greek Revival architectural style which may have reminded Levi Peirce of the store which his father operated at Middleborough.